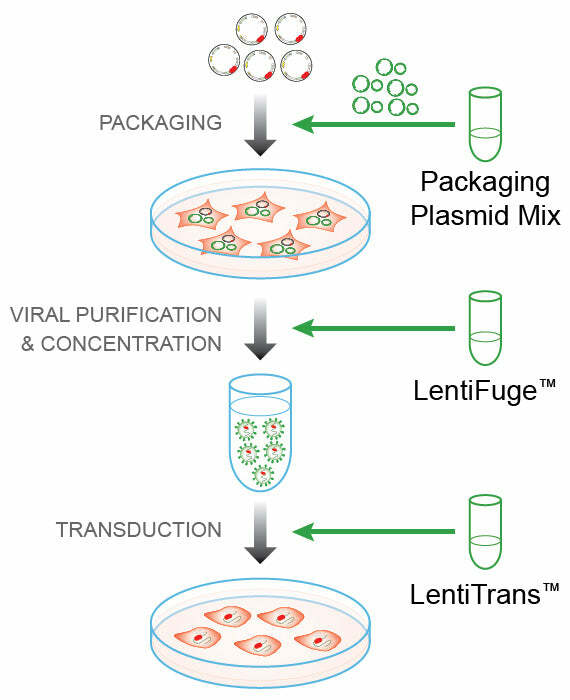 Cellecta’s LentiPrep™ Lentiviral Reagent Set contains three of our popular reagents: the Ready-to-Use Packaging Mix, Lentifuge™ concentration reagent, and the Lenti-Transduction reagent. Also included is a control plasmid to test the protocols in your cell model. 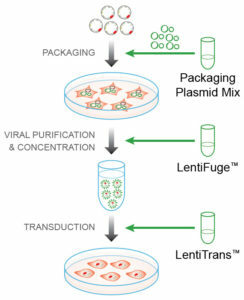 You receive 1 unit of each reagent, and the lentiviral control plasmid has either GFP or RFP to test packaging and transduction efficiencies with your cells. Enough packaging mix for approximately 50 ug of lentiviral plasmid (e.g. 25 10-cm or 8 15-cm plates). Each of the reagents is also available for purchase separately as needed.